Does it works without antenna?? Cool! do i need and extra antenna? This does not have an antenna included on it. See the related products for the U.FL adapter and matching antennas. Yes, that's the beauty of WiFi. On the laptop or smart phone you have to have an App that will connect to it... so anything custom you will have to write yourself. However, a quick and dirty way to get some communication going is to run a Telnet App (Freely downloadable) on the laptop or smartphone and use that to connect to the module. 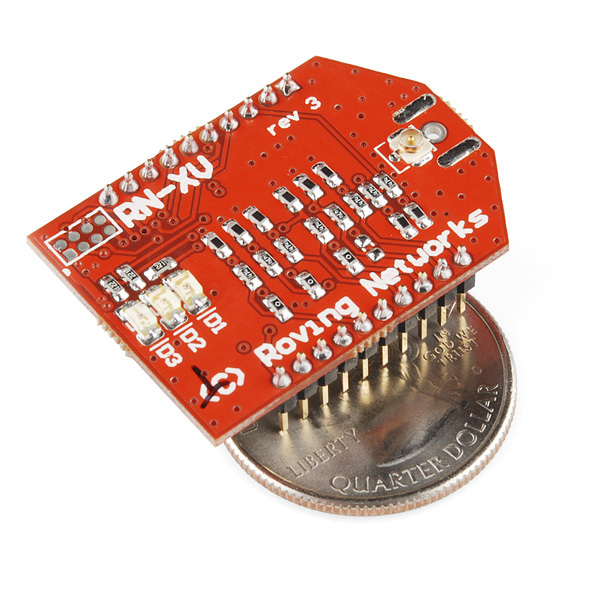 The Roving Networks modules insulate the Arduino (Or whatever you connect it to) from the TCP/IP stack, data is just sent and received serially through the UART on the module. Thanks! So the result would be a straight-up serial-type connection, from the Telnet App to the Arduino? Or is there a more complex protocol involved? 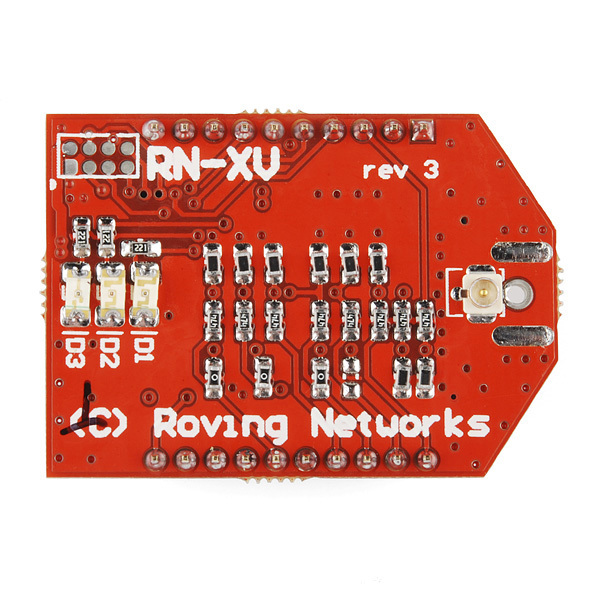 CAn we communicate between two rn xv modules and laptop or pc??? 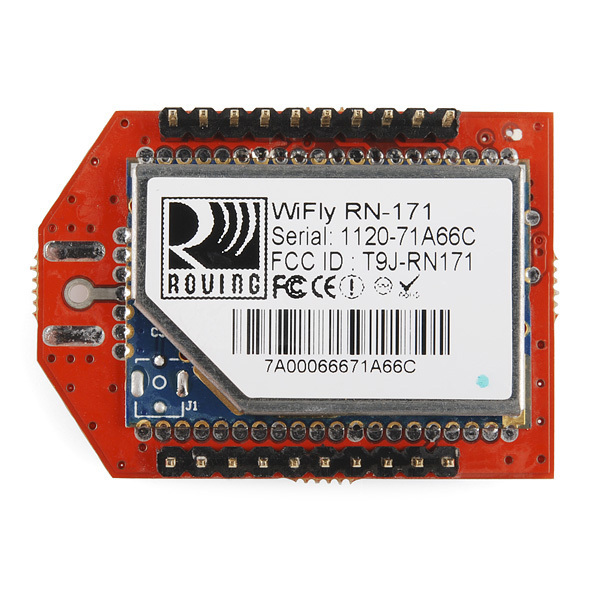 About 6 months ago I ordered/got a RN-XV WiFly Module (WRL-11048) but was busy and until last night had not opened it. with much excitement to make use of WiFi and Arduino I cracked it open and soldering on 4 leads: Pin 1 - Power 3.3, Pin 2 - RX, Pin 3 - TX and Pin 10 GND... no problem easy enough with soldering paste, helping hands and a magnifier. I weird it up to the Arduino and upon powering it I see my RX/TX LED's go nuts and my PC thinks I have disconnected the USB. I inspect the soldering job with microscope and things look just fine.. NOTE: I do not need to connect the rx/tx to make it go nuts, Only ground and 3.3 power. Any ideas here as to why my RX/TX LED would go crazy.. When you 'weird it up', the expected behavior is to 'go nuts' and 'go crazy'. Not sure why you would expect another result. I don't have the TX/RX hooked up and the lights still go crazzy/nuts and my PC thinks I have disconnected USB. I would suggest using a genuine Arduino product. Knock-offs have unexpected behaviors. In the picture from the link you posted above, the web address on the board should be arduino not arduion. There should be a "Made in Italy" declaration top-left on the board near the USB port. I love this device. I just received it and within 10 minutes I was up and running my own AdHoc WiFi network, viewing data on my WiFly connected FEZ Cerbunio Bee from the browser. Next I want to setup the WiFly to automatically transmit data on the sensors via WiFi/HTTP to a listening server. This works fine in the FEZ Cerbuino Bee, but when I try the WiFly alone, with only power and ground connected, it connects every 5 seconds to my HTTP server but it doesn't post any data (aside from the HELLO I set as the static connection greeting). Any ideas? Do I need more than power and ground connected to run the WiFly all by itself? Do i need an extra component for programming and mount at breadboard? 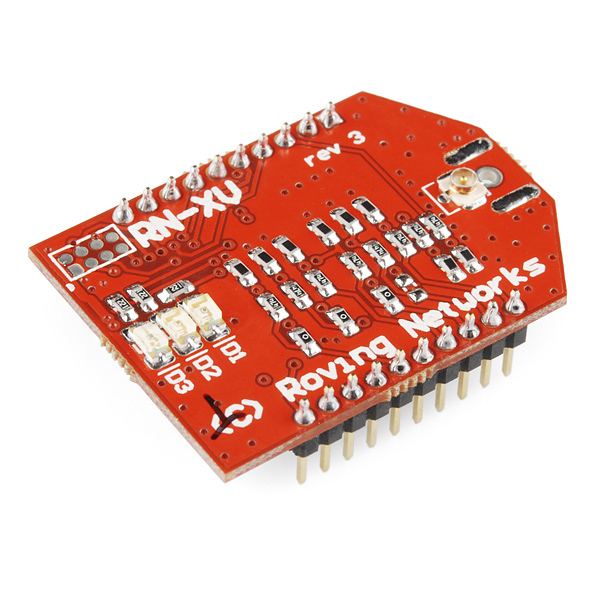 Hi, i just bought wifly rn-171 module but couldn't distinguish which pin represent what, anyone has a link to easy to understand diagram, where it say which pin represent grn, rx, and so on?? or how can i identify it?? Has anyone ever used these with a Ubiquiti PicoStation M2HP (or NanoStation Loco M2)? It works great with my ASUS, but I'm thinking about setting up WiFi to cover an acre in which case I'll probably go all Ubiquiti. Update, for anyone looking at Ubiquitis products: PicoStation M2HP came a week ago, finally got a chance to test the 2 together and didn't have a problem. I don't know how strong of signal the RN-XV sees but the PicoStation sees -52dBm from the RN-XV and it's outside by the garden ~100 ft away with a little rubber duck antenna, so the RN-XV probably sees ~-40dBm. If I went with the NanoStation Loco it would be stronger due to the directional antenna but not as useful for multipoint. On a side note, Ubiquitis AirOS is amazing, AirView tool(spectrum analyzer) made it easy to find the least used channel and is more helpful than a standard site survey. What is the range of this module? can you use just 2 of these standalone, like xBees? At power up, using TeraTerm, I am getting WiF,WiF,WiF,WiF,WiF,WiF,WiF,WiF, streaming in. And I type $$$ and nothing changes just get the WiF,WiF,WiF, coming in non stop.. What can be causing this? Are you using 9600 baud? I have a similar problem. I see it talking but get no response to $$$. Did you manage to resolve this? This device generates the TCP/IP stack correct? Which leads me to assume that it is not restricted to WiFi "Hotspots" and can be used anywhere? That is correct, it can be set up to run independently of a AP in adhoc mode. For instance, battery operated WiFly and laptop or smartphone in the middle of a cornfield 20 miles from the nearest hotspot and you can get real time sensor readings or communications with the module. Download "wifly command reference" from microchip. Practice with a terminal program (9600N81) with local echo so you see both the command and the response. "get wlan" "get ip" and "get everything" are good commands. Don't forget the $$$ to get into CMD mode. Update to 4.41, both .img and .mif and "run web_app" to enable soft AP mode. FTP server address is 198.175.253.161. I'm using it to post temperature data to a web server. This works very well.